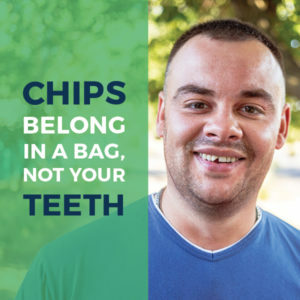 So many people come to our Asheville dental office with chipped or even cracked teeth and need help to get out of pain and to stop any further damage. Has it happened to you? You take a bite of your lunch and feel something a little funny in your mouth. Is something stuck in my tooth? Is there something in the sandwich I didn’t order? But then, you see it. It’s part of your tooth. Maybe it’s a molar or one of your front teeth, but now your tooth is compromised and could be painful. As we get older, the enamel on our teeth can begin to break down, leaving them vulnerable to chips, cracks, and other dental deterioration. If you’ve recently noticed chips or cracks in a tooth or teeth, it’s time to talk to us. Finding a solution to your problem now could help keep things from getting worse (and no one wants that). Enamel is what you’ll find on the outer surface of your teeth. It’s biggest job is to protect your smile from decay, but it needs your help along the way. Even though tooth enamel is considered to be even stronger than bone, nasty plaque bacteria and acid can be its biggest enemy. And once you start to lose your tooth enamel, it’s virtually impossible to get it back. Look at your teeth in the mirror . Do you notice any chips or hairline cracks? It’s probably caused, in part to enamel loss, especially if you’re 50 or older. What’s the solution? Well, as we said before, you can’t regrow enamel, but you can eat foods that are high in calcium, swap sugary drinks for refreshing water, use an enamel-strengthening toothpaste, and see your Asheville dentist regularly for checkups. Think back to the lunch scenario we talked about earlier. Have you ever been eating something like a piece of ice, popcorn, hard candy, only to lose part of a tooth? Sometimes the damage is minor, but other times you can lose a larger portion of a tooth. This can be painful and annoying when you try to eat or speak. 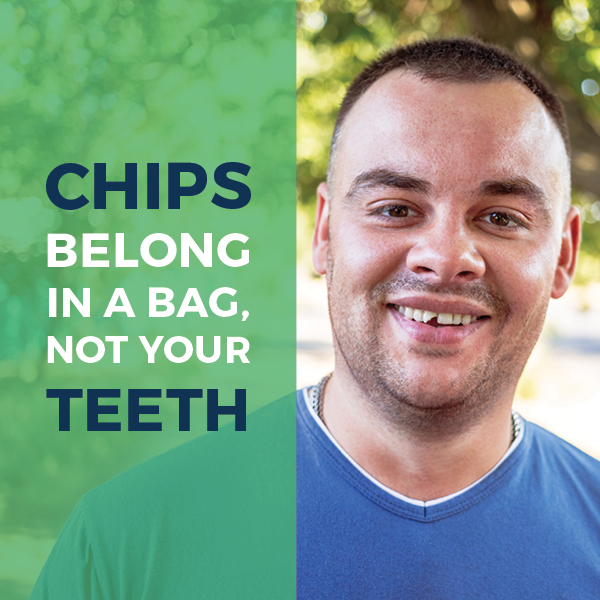 Chips are usually easy to see because part of your tooth is missing, although sometimes they occur on the surface of a tooth and it’s not immediately noticeable. If you have a tooth or teeth that are chipped after biting down on something hard, take comfort in knowing we see this kind of thing a lot in our Asheville dental office and we can fix it for you. Even if you brush your teeth every day and see your dentist every six months, just like you’re supposed to, sometimes cavities happen (no matter what you do.) Unfortunately, if the cavity or decay starts to grow, it can leave your tooth open to cracks and chips. This is one of the biggest culprits for causing something called cracked or fractured tooth syndrome. Sometimes the cracks are visible and noticeably painful, but you can also have a broken tooth and not even know it. This is why we rely on powerful, yet safe digital X-rays to uncover the truth. Some cracks are so small; even X-rays can’t detect them! Cracked tooth syndrome is relatively common, and patients between the ages of 19-40 and 60+ tend to have increased chances of this happening. The important thing to remember is to get your chipped tooth or teeth treated as soon as possible to avoid further breakage or damage. We promise there’s a way to get your smile whole again that will work for you and your busy schedule. If you’re reading this and rubbing your broken tooth with your tongue or if it’s painfully scraping against your cheek, call Phillips & Schmitt DDS at 828-254-1944. Waiting is never a good thing: for you or your smile. Schedule your visit for a consultation and some consolation!